No, the word is not “yakitori,” though that is what you are looking at above, and that does play a small role in this post. A delicious role, actually…all scalliony and salty and glazy. No, yakitori, as good as it is on the grill, shared with friends on a Saturday summer night, that is not the word I want to talk about today. On Saturday morning, Abby, who had just wrapped up seventh grade the day before, said to me all forlorn and only a little sarcastically, “Mom, summer’s almost over. It’s going way too fast.” I should remind you here that this is the kid who doesn’t want her birthday to come because in her mind, its arrival means she’s that much closer to it being over. But I know what she means. I remember when I was a kid, looking at my town’s abandoned Labor Day pool — everyone squeezing in one last trip before school started — the fall breeze whipping little ripples on its surface, and longing for it to be Fourth of July instead. Did I know how good I had it on the Fourth, the whole summer stretched before me? I’d ask myself. Did I? At some point, I got used to the idea that certain things move fast, and way up on the top of that list of things was summer. By the time I was Abby’s age, I had taught myself not to take Independence Day for granted. In between bursts of fireworks, I’d ask my enlightened self: Are you paying attention? Your Labor Day self is going to be soooo jealous of your Fourth of July self. I was still filled with dread on Labor Day, but it brought a small measure of comfort to know that I’d at least had the wherewithal to recognize the moment, that I had lived that moment with…intention. It’s come up a lot lately. Early in the month, I got an email from one of my media friends, David, the father of a 16-month-old. 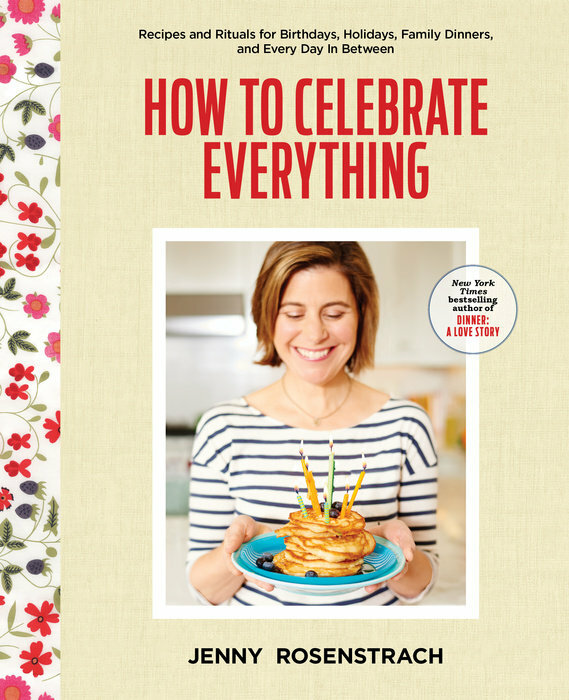 He had received an advance copy of How to Celebrate Everything and said to me, “This is what I need right now. The reminder to live intentionally.” My first thought: Where were you when I was subtitling my book? (A Year of Living Intentionally?….A Year of Intentional Thinking?…A Series of Intentional Events?) My second: For real? You really truly want to be more in the moment during those sleep-deprived, diaper-changing years? I’m joking. Of course we do. (Do we?) YES, we do! Of course we do! “The sense that summer fun slips through our fingers is real, and it’s reflected in how people report feelings of health and well-being over the course of a 24-day vacation: Our positive feelings increase quickly at the outset, peak about one-third of the way through and then start a downward slide toward our baseline happiness — and sadly, leave us back there about a week after we return to work. My first thought: My seventh-grade self was not insane. My second: Wow, that is one amazing idea for a family series. Each week for the next two months Motherlode will put forth a simple challenge. This week’s: Ride your bike or walk somewhere you’d normally drive; pick a short distance so it might turn into a summer ritual. I haven’t done that one specifically, but just the whole idea made me realize that there are a few beginning-of-summer rituals in my family — a kick-off summer BBQ with our friends Todd and Anne; an adventurous hike; a trip to Pixar’s annual June release — that needed to be actively recognized and celebrated, and then intentionally set into memory amber with tasty food, thereby maximizing the chance that my kids (and their parents) will be able to call upon the resulting summer happiness all year long. I intentionally picked a meal that I’ve been intending to make forever. (OK OK JENNY WE GET IT!) I first spied this in Bon Appetit‘s Grilling Book about three years ago and it has been on the short list ever since. (The book is a summer must-have btw; Here’s a highlight reel if you need convincing.) Note: Nothing wrong with throwing a few hot dogs on the Weber too, should you have any young yakitori skeptics in your house. This recipe has been adapted. Heat a small nonstick skillet over medium heat. Cook 2/3 pound (1 1/2 cups) ground chicken, stirring frequently, until it is opaque and just cooked through, about 2 minutes. Transfer to a plate. Combine cooked chicken, remaining 1 1/3 pound chicken, scallions, miso, and 2 tablespoons oil in al are bowl. Knead until a homogenized, sticky mixture forms, about 5 minutes. Clean hands; lightly coat with oil to prevent meat mixture from sticking. Divide mixture into 16 equal portions. Roll each into a ball, then form each ball into a 4-inch-long cylinder. Insert skewers (BA suggests two 6-inch flat wooden skewers per cylinder, which I’m sure made them easier to handle, but as you can see, we used regular old metal ones and it was fine). Press meat gently to flatten slightly. Repeat with remaining skewers and meat. Build a medium-hot fire in a charcoal grill, or heat a gas grill to high. 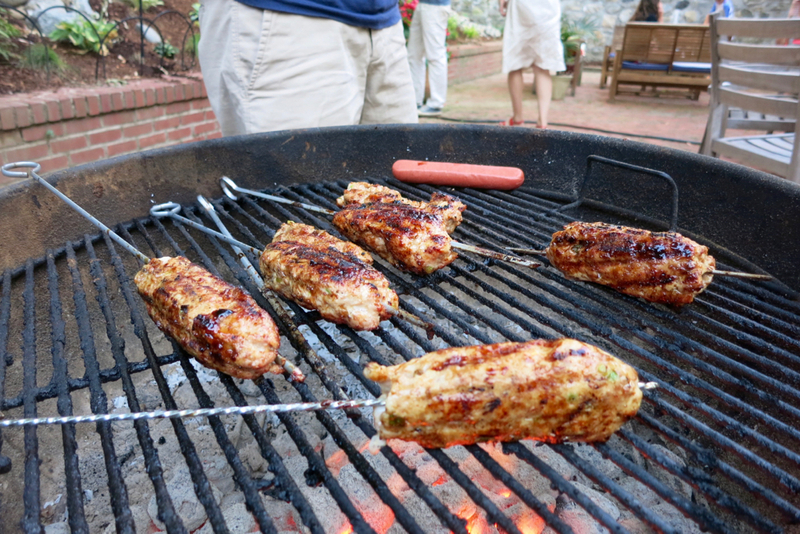 Brush grill grates lightly with vegetable oil. Place yakitori on grill in batches, turning every minute for 4 minutes. Brush with Tare and continue cooking, turning once for 2 minutes. Brush again with Tare and grill, turning once, until cooked through, about 2 minutes longer. Serve immediately. Place a fine-mesh sieve over a small bowl. Bring all ingredients to a boil in a small heavy saucepan, stirring until sugar dissolves. Reduce heat to medium-low and simmer until reduced to a generous 1/2 cup, about 20 minutes. Strain Sauce, discarding solids in sieve. Let cool. DO AHEAD: Can be made 2 weeks ahead. Cover and chill. This recipe was reprinted with permission from Bon Appetit. On Sunday, we hiked Mt. 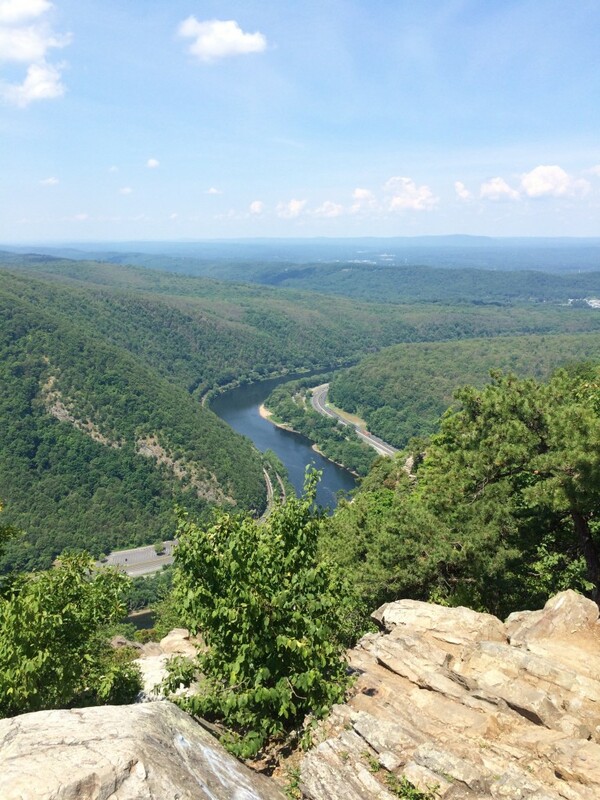 Tammany’s Red Dot Trail overlooking the Delaware Water Gap. Halfway down the mountain, Abby said, “You know what should be a ritual? Milkshakes and French fries after a hike.” I couldn’t agree more. P.S. Spontaneous giveaway! I don’t have advance copies of my book yet, but I do have a single galley (a black-and-white paperback) that’s looking for a home. Comment below with a favorite summer ritual to be eligible to win it. Contest ends Wednesday 6/29 at 8:00 pm ET. Update: The winner has been chosen. Thanks for playing everyone! we love making homemade peach ice cream! The summer ritual that I most miss is packing for summer camp. I spent 6 blissful summers as a young girl at a camp in the Monterey Bay. Nothing beat the anticipation and excitement of getting ready to head to camp. I’ve always struggled with the feeling you describe of time slipping away, and so the anticipation of the trip has often felt like the pinnacle moment. As an adult, I’ve come to appreciate the fleeting moments (of vacation, of summer, of my recent wedding weekend) as they are happening, rather than wasting them in longing for more. PS- would LOVE an advance copy of your book. our favourite summer ritual is camping for 7 days with friends in Bon Echo Provincial Park. Our girls make new and lasting friends, we get to relish in a slower day, and we make memories to talk about all year long. ooooh, I can hardly wait! 3 weeks and counting. I really like the idea of celebrating everything; my husband and I used to be really good at it but have slipped in recent years. I like the idea of intention and making the ordinary special. A new ritual we’ve created this summer is riding our bikes along the Burlington (VT) bike path to get creemees (VT parlance for soft serve ice cream) after dinner at least once a week. The family togetherness and beautiful setting as we pedal along Lake Champlain as the sun sets is just too perfect. We spend a week at the NJ shore every August, renting a house near my aunt. Every morning, my sons go over to her house for “second breakfast.” No food is off-limits at second breakfast – freshly made doughnuts, Doritos, basically everything that is severely limited every other week of the year! A a teacher I start to panic on July Fourth. So many summet rituals though, but my favorite is watching the Perseids meteor shower. Last year we went to the Upper Peninsula, MI and it was fabulous.This year we will be at tbe Great Sand Dunes National Park in CO.
movie nights in pjs w popcorn and sleeping bags in the living room…a camp-in! Ice cream. Lots of it. Anytime we feel like it, even if it’s not a weekend. And if you’re me, it’s got to be inside of a cone. It just doesn’t taste the same in a bowl. We started going to the library after dinner once a week this summer as a whole family. . We each pick out a pile of books. Then we stay up a little later reading together in bed. My boys are 6 and 2 and going out of the house after 6pm feels like an adventure to them. We live near the beach, but because summer is also tourist season we don’t usually go during the day. We try to eat an early dinner one night each week so we can hit the beach for the evening! It’s easy to find parking, you don’t have to wear sunscreen, and my girls get tired out before bed. One of my favorite things about summer! A favorite summer ritual at our house is our “to do lists.” Now, I know this seems counterintuitive to The essence of summer, but stay with me. I’m a teacher, so I relish my summer to do lists because along with the typical “mop floors” they involve things like “plant perennials” or “make iced coffee”, all things I relish during the slower pace of summer months. But the BEST part of the to do list ritual is when my kids add to them. So, suddenly, I find that my list contains things like, “play play dough,” “make art,” or “go to the blue park.” They remind me to slow down and savor the Summer for what it is: a time to recharge, enjoy the little things, and make precious memories. On Saturday’s in the summer we love to walk to the local coffee shop where my two girls have donuts and I enjoy an ice coffee. We sit outside and watch the trains all the road bikers pass by. Love it ! One of our favorite summer rituals is going to the rodeo. My dad lives in Utah and each summer we take our two young boys to visit him for a week around the Fourth of July. We’re from the Midwest, so being out there in that dusty arena, surrounded by mountains, makes us feel like we’re in a whole other world. And our boys love watching the cowboys up close. Evening swims at the pool after camp and work. My favorite summer ritual is the 4th of July part I always host – unfortunately I can’t this year because of a wedding and that’s making me sad! In our family, Fourth of July is the highest ranking holiday. We host a lakeside bbq for extended family that wouldn’t be the same without grilled beef tenderloin, flag cake. and plenty of cold beverages. This year, I’m adding your minty pea dip to the appetizer spread! Though the highlight of the day is the annual croquet tournament and trophy presentation (minus the year’s worth of trash talk leading up to the tournament). Would love a copy of the book! That first glass of my father-in-law’s rum punch that he learned to make on a high school vacation in Bermuda … that means the real start of summer. Impossible to drink before Memorial Day or after Labor Day. Best consumed on the porch with a view of the sea. Ooh, is there a recipe for the punch? One of my favorite summer rituals is standing I the ridiculously long line at Little Man Ice Cream with my son while we drool over the ice cream flavors. We chat with our line neighbors, talk about the giant ice cream can store front, and just enjoy our time together. And the ice cream, of course. We make a “Summer Fun Bag” every year. We write things we want to do over the summer on slips of paper and put them in the bag. They can be small or large, specific or general. (Eat dinner on the patio; Go to outdoor music; neighborhood-wide water balloon fight!) As we are thinking of things to do, we pull the slips out of the bag and see if it fits the bill for that day. Just looking at the bag makes us smile. During the summer, our city offers free weekly outdoor concerts. My husband and I as well as a couple of my co-workers love to take our lawn chairs, a picnic — or sometimes even stop and get a pizza. It’s a way to be outdoors and relax with family and friends! Potato salad…whenever we could. Pickley and a long standing family recipe. Nothing screams summer like that potato salad. Also, Monday evening family nights up the canyon. My dad makes a mean Dutch oven dinner. Cheesey potatoes, steak, (mom snuck in a salad), peach cobbler AND s’mores with a cooling breeze. We ate chips and salsa and played cards games while dinner cooked. Bliss. Weekend cocktails on the back porch followed by a long, lazy dinner (preferably from the grill. This recipe is on my list). Cold watermelon eaten outside so nobody worries about dripping watermelon juice on the floor. So nice on a hot hot day! Summer is our jam! We especially love our tradition of heading to my folks’ house for Sunday dinner, which always includes grilled meats with lots of sides, and swimming. We have a 14 month old and have started to think about creating summer rituals that we can continue to do as she grows up. We started Friday night pizza and movie night (where we watch some sort of animated movie and she pays attention for 10 seconds) and after dinner family walks. But lately it’s the little rituals that mean the most…cranking up the music while cooking dinner and dancing in the kitchen, bedtime stories with the books we got from the library (that we visit religiously every week), and popsicles in the pool (baby pool) that mean the most. Our favourite summer ritual is breakfast picnics. It started as pure survival when my girls were tiny and sprung to life at highly offensive hours of the morning. In those days I would swing by Starbucks and grab provisions, but now that the girls are bigger (and mercifully sleep a bit later), we bring muffins, fruit, yogurt or whatever we have in the house. The beach is always quiet, and a bit cooler than later in the day- perfect for a peaceful swim. Homemade ice cream and popsicles. My 4 year old started asking about them 2 weeks ago! This year was our second annual daytime slumber party. My little one and I pull the mattress into the living room while daddy is at work. We watch trashy TV, play with makeup, do spa treatments, and eat lots of popcorn. Drinking wine on the porch while dinner cooks on the grill! Our favorite summer ritual is going for a swim most evenings after dinner. Great way to end the day ! Happy summer! My husband is a teacher, and we LOVE our summers. We always pick a sweltering southern July day and head to the Blue Ridge Parkway to hike Black Balsam Knob and Graveyard Fields–easily 15/20 degrees cooler. We let the kids stay up late to catch fireflies. It is truly summer when the yard is filled with them. The summer ritual that I love most, and have been celebrating since I was a child, is nighttime firefly chasing. Staying outside past bedtime, sometimes in pjs, and catching fireflies to set on fingers or ears or hair is one of my most treasured rituals with my own kids. One of my favorite summer rituals is an annual outdoor neighborhood potluck with good food, friendly neighbors and lots of children riding bikes and running around having fun. As a child I had fond memories of going to a restaurant near the Jersey shore on the Navesink River called Barnacle Bills. They have a nautical theme and a wall of windows looking out onto the water. The waits are brutal so while you wait you can feed the ducks outside, or eat from the bowls of peanuts at the bar. The peanuts were everywhere, as people would leave the shells wherever they waited. They have the most amazing seafood and burgers. My children have severe nut allergies so I worried I could not keep up the tradition. Then, a cousin told me they removed the peanuts. Now, every summer, my kids get to enjoy it like I did, feed the ducks and eat steamers and burgers. Lots of evening strolls, visiting family, and ice cream every night! We have a few: milkshakes on the last day of school; annual trip to the “Sea Shell Shop” at the beach and everyone gets a $5 budget; Wednesday nights at the AIR-CONDITIONED library; listening to a book on CD all together (usually sitting in front of out house because we can’t stop…). summer is my happy place! our summer ritual is to get snow cones on saturday afternoons spent poolside. we have a little place called bedford snoballs and its a tiny house in the middle of a neighborhood…no one makes snocones like them! Vacation cereal: those multi-packs of little boxes of “sugar cereal” that are off-limits the rest of the year. Both my family and my husband’s family had this ritual when we both were children, and it’s something our kids look forward to on our yearly trip. Signing the boys up for the library’s summer reading program and bringing armfuls of books home every week!! I am so with you on this! I just shared our summer bucket list over on my blog and expressed a similar sentiment – that when we approach summer intentionally, it makes for a much more memorable and enjoyable summer. One of my favorite summer rituals, choosing a summer theme song. The kids and I picked Michael Franti’s “Sound of Sunshine” for this year and it really does make it feel more like summer every time we turn it on! CAN’T WAIT FOR YOUR BOOK! For the past couple of summers, my family and our close family friends all compete in a sprint triathlon in Warren, CT. It’s the only triathlon any of us do all year (we call ourselves “competers not completers”). First we swim in the lake, then bike the perimeter of the lake, and finally run uphill to a vineyard, where the finish line and wine-and-cheese after party are held. Afterwards, we all head back to our friend’s lake house, where we spend the rest of the day hanging out on the dock and eating unlimited amounts of blueberry-peach cobbler with vanilla ice cream. I live for summer (teacher!!) but my favorite ritual is impromptu happy hour plus evening swimming at the lake with the kids. We grab hot dogs and corn and charcoal and cold beer for me and the hubs. And the kids swim in the calm water and the husband and I count our lucky stars. We have just one child, now 16, with a December (24th!) birthday, so since he was tiny we celebrated Kid’s Day. Mother’s Day is in May, Father’s Day is in June, and Kid’s Day is in July. On a day of his choosing (especially now since he works), he gets to pick an activity (bowling, ball game, Hershey Park, Sky Zone, etc), choose one friend to come along, and select what he wants for dinner and one (reasonably-priced) longed-for item. All is negotiable- but it always ends a little sunburned and sweaty, and with the deeply pleasing exhaustion of seeing my kid especially joyful for a full day. One of my favorite summer rituals is making my mom’s famous flag cake for the 4th! I’d love to win a copy 🙂 it looks amazing! Eating dinner around 9:00 every evening, because then it’s nearly dark. My favorite ritual is definitely the annual Fourth of July trek to my aunt’s house in Harbor Springs in Northern Michigan. It’s one of the cutest towns on earth and we spend it destressing, grilling and drinking rosé! Favorite summer ritual: ice cream on the beach. There’s a nice walking/biking trail behind our house, so we often walk to a nearby grocery store on the trail to get popsicles, then walk home! Our summer ritual is to go to our local Mexican place on Monday nights for tacos and chips with salsa, then to sweet frog for dessert! Summer camp, camping trips and when my kids were little our annual canoe camping trip on Labor Day weekend. Oh my gosh, I want that galley! DALS is one of my favorite cookbooks, especially now that I have a little one of my own. 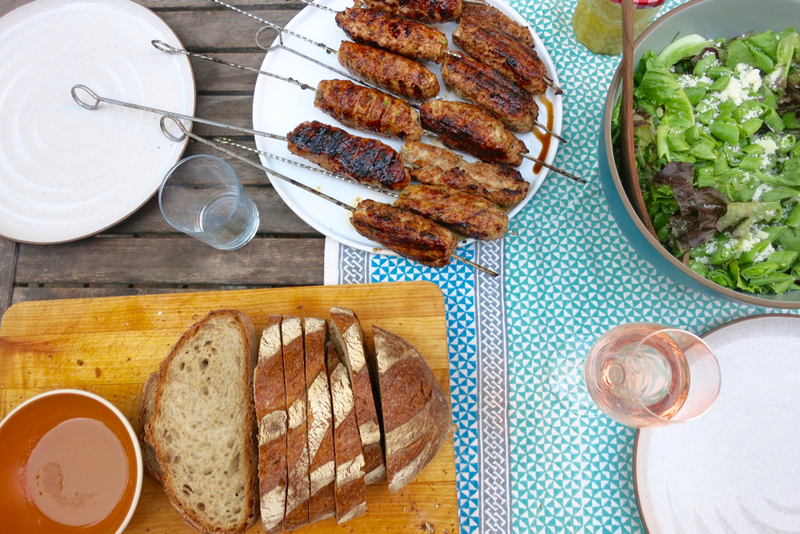 Our favorite summer ritual is grilling in our backyard on a weeknight – just making those nights so much more special and relaxing to be outdoors. We love to participate in our local library summer reading club! The first overnight of the summer on our sailboat, tucked in somewhere on beautiful Penobscot Bay (Maine). We take a Summer Solstice trip every year. The only requirement is to travel to a place where we can enjoy an extra late sunset (typically Northwest, but just north works, too)! Favorite summer rituals. Ice cream for dinner at least one night per week! A trip to the local outdoor Beer Garden on the first warm night of summer to bask in it while sipping craft beers and hard ciders. I am 67 years old and I LOVE your blog. My favorite summer ritual is a memory from childhood. We were not allowed to go barefoot until May 1, no matter what the weather was. We always started begging around March 15 or the first warm spring day. It was so liberating when we were finally allowed to run thru the cool grass barefoot on a warm summer day. We love our summer block movie series. The entire block is invited, we set up a movie projector in a driveway, everyone brings their own chairs and we watch a kid- and adult-friendly movie on a white sheet that is hung up for the occasion. Popcorn and blankets all around! Taking my kids to the beach! We spend 4th of July with family in a small town. Parade, lunch and games in the park. Fireworks at night. During the school year, because of our busy schedules, we all exercise independently. We make it a point to go on family runs and bike rides on most summer weekends. Our summer ritual is making a “Summer Do” list. Everyone gets to add something and it can be anything we can do together in our state. We love remembering the fun of summer’s past activities and adding new ice cream shops or parks to our list. It’s also a ritual that during the last week we cram in as many unaccomplished items as possible. Too many to list just one….annual vacation right after school gets out to same place and doing same rituals each year there (hike, beach, card games, dinner at a lobster shack, catching crabs and releasing them, night swim, outlets to get new summer sneakers22…), dinners at our local lake every possible weekend, fireworks, ice cream runs after dinner,drive in movie, summer wish list, summer to do charts for each kid, library summer reading program…we don’t do big things, just a lot of little things that are likely meaningless to anyone besides us! We kick off summer with a yard sale and the kids earn a stash of money for the ice cream truck. Brunches outside on our patio. When we’re getting ready to go away for our first weekend out of town every summer (usually to Santa Barbara, and sometimes camping) we buy one of those multi packs of the individual cereal boxes. Everyone fights over the Froot Loops, but it’s so much fun to eat unhealthy cereal once in a while, and it really says SUMMER VACATION! We have our family picture taken every summer. It was a “one-time thing” that just turned into an annual summer thing. Most of the time, I’m cursing hours before the shoot, trying to wrangle bodies into put-together coordinating outfits. We are all sweaty and tired by the time we get to the photographer’s spot. But I always forget about the sweat and tears by the time we get our proofs back! And we get to enjoy a sunny memory on our dining room wall all year long while we eat dinner together. Great post. Something Im trying to do so we can savour each and every moment of summer! oh and favourite ritual would be berry picking! I need a grill! I think my family would enjoy trying these. Our summer ritual is going to the same 2 adjacent arts festivals and picking up new things from our favorite artists. For me it’s 2 new pieces of ceramics every year. My favorite summer ritual from age 10 on through highschool was on my week off between school ending and before my camps or my job started I would wake up early early (6 am) in the summer and head out to the hammock with breakfast (usually a rhubarb crisp from the night before with a scoop of yogurt because hey thats breakfast!) and stay reading on the hammock until noon in my pjs. I would finish a book a day! We’ve traveled to Northern Wisconsin to visit family friends over the 4th since I was 4. My husband loves to go as well, and it’s been great to to experience a childhood tradition with him. We go on a family holiday every summer. Three weeks of camping, with BBQ’s, swimming even when the weather is cold, hiking, watching the shooting stars around my birthday (sometimes freezing even when we’re wrapped in lots of warm clothes and blankets, but the four of us lying on our backs looking up), endless reading of books and playing, kids helping with the cooking, <3 big hearts for the summer!!! I love having movies on the lawn and inviting all of our friends and neighbors! We provide the popcorn and everyone brings their favorite candy. It’s a neighborhood favorite! Since becoming parents, we have shelved our Friday patio bar ritual, but now we leave the baby pool out so we can soak our feet while we grill dinner and nurse our G&Ts! We live in Austin, Texas where it is hot, hot, hot in the summer. We often throw our swimsuits and towels in the car on date night and end the evening at Barton Springs Pool (a spring fed, 68 degree gift to our city). Cooling off in the dark (its free after 9 pm!) with the cityscape glowing in the distance with all out other cool seeking Austinites is a great treat at the end of a hot day. And then we scurry home and hop into bed while our skin is still cool. Heaven. Thank you for the giveaway! My favorite summer ritual is making the 10+ hour drive north to spend two weeks at a primitive cottage on the St.Lawrence River built in 1890 where my husband spent summers as a kid. It’s our annual family reset button! Buying a new pair of sneakers for the year! There’s something about the bouncy springy-ness and glow in the dark white-ness that spells summer to me. Summer is the time for “speedies” – a Endicott/Binghamton NY specialty. I use pork which is merinaded and then grilled. Delish! Left overs are even better! Nothing says summer like speedies! Eating watermelon in the sun!! Eating watermelon at the beach! strawberry picking! My mother and grandmother always took us, on a week day to avoid the crowds, which meant we got to go into school late! Then we helped make lots and lots of freezer jam and ate strawberry shortcake every day for a week. To celebrate the last day of school today we started a new tradition of going out for a quick breakfast rather than the usual cereal & toast – it was such a fun change in routine! Camping! Making a fire and sitting around it drinking tea and roasting marshmallows. We’re trying to figure out how to camp with our two-year-old and actually have her sleep so the next day isn’t a total wash. I love EVERY kind of fruit picking – strawberry, cherry, blueberry, peach… So much fun! (not sure if this went through): I love EVERY kind of fruit picking – strawberry, cherry, blueberry, peach… So much fun! Fun, fancy drinks for mom and dad, and non-alcoholic ones (with an umbrella!) for the kiddo. Sipped outdoors, of course! We have always baked lemon bars on the last day of school. For some reason my kids associate lemon bars with the kick-off to summer vacation. Also, blueberry picking at the local farm on Fourth of July. We’ve been walking home from the weekly farmers market to enjoy the evening. When my family and I go down to Hatteras every summer, we spend every single day on the beach, ALL day. Reading, napping, walking, swimming, totally blissed out. But my favorite ritual comes at the end of the day. My husband, mom, and brother, all tired of the beach, head back to the cottage around 5, leaving me and my dad with our books, beach chairs, and the cooler. We sit, just the two of us, for that magical last hour before dinner when the sun is no longer hot but the water is still warm, most of the families have left and the beach is quiet. Sometimes we talk, sometimes we take a last swim, but for the most part we sip a beer and just stare at the water. I savor every minute of that precious hour with my dad each evening. That ritual makes me feel safe and peaceful and crystallizes into the perfect piece of summer to hold all year. My favorite summer ritual is lobster night at the beach right in the middle of our annual week in Cape May with all of the cousins. We are always short of money so our summers are very modest, but our weekly pilgrimage to the library is always a treat. My favorite summer activity is going out for frozen yogurt after dinner on a random weeknight. There is something so liberating about no school the next day for the kids. No homework and no one has to get up early. Even though I still have to get up early for work, it is so easy to only get myself up and out the door while my teens sleep in. Also, we have been playing games a lot as a family – Clue, Monopoly, Uno, and Blokus. Summer is about barbecue, farmer’s market, and peach crumble milkshakes! Summer ritual…Orange County fair in Costa Mesa, walking distance from our house. Newborn piglets, sugary funnel cake, cold beer, and good friends make the event one of our favorites! Playing ghost in the graveyard! It only happens in summer when kids are up too late, running around at twighlight and scaring the living daylights out of each other. Homemade popsicles on the front porch after dinner! Here in Vermont, a day at the river has to be followed by creemees. Not up for discussion. Staying at the pool until the last possible moment when it closes for the season. Ice cream for dessert at local farm stand. We usually try to limit sweets throughout the year, but in the summer it feels like you’ve earned it! Love the ritual of making peach pie in the summer. Served with vanilla ice cream, it’s perfection! We live at the Jersey Shore. When the grandsons come for an extended stay we make sure that one nite we go out for “ice cream sundaes ” for dinner. Why not! We live in a three-condo/floor house in Boston and our summer ritual begins in the backyard with our upstairs neighbors. It started a few weeks ago and now I don’t even walk in the front door after work, I know to go around back-we get home from work/school, put the combined kids in the back yard, and let them have at it while we gather dinners. Someone takes turns donating drinks, and the neighbors next door come by too, and it has been making regular weeknights feel like celebrations (the use of the word there and your book title was not actually intentional!). Eating every meal outside – we are in the mountains of colorado so eating outside is only a summer activity. We treasure it. I even built a new farm table outside. It’s 8 feet long so plenty of room for neighbors to stop by and join us. I love this post so much- I just printed a calendar for the summer to try to be more intentional about the way I spend even random weeknights. I think its such a great idea not only to try to be intentional with each day in the summer, but try to find things to repeat each summer and make them a tradition. A few ideas: 1. Alta Linea in the Highline Hotel on random weeknights for their to-die-for frozen negroni, 2. self-guided pizza tours, 3. day trip to Beacon for hiking and beers at the Hop! picnics, outdoor concerts and eating dinner outside, every night if we can! Homemade popsicles, night swims and lots of camping! I love this idea of intention, ritual and making memories. For me, in summer that means strawberry and blueberry picking, lots of ice cream, homemade lemonade, and afternoons at our little town beach. My favorite summer ritual is packing up on the weekends and heading to the beach with my husband. I love living close and enough that this can happen! So looking forward to your new book! I need the message of living intentionally as my two kids and I spend a sunny afternoon on our devices……..but I’m reading Dinner: A Love Story not playing a silly game or watching a vlog (appropriate amount of indignation inserted here). Thanks for planting the seed! Girls wine night on my couch becomes girls wine spritzer night on the deck! Love summer. pizza mondays. It’s the best way to start off the week, with something thats a bit fun and delicious, plus there’s always so many toppings ideas since i’ve just been to the grocery store! Our fave summer ritual is our annual family beach trip. Pink salty cheeks, sandy sandwiches, baby powder to get the sand off at the end of a beach day…. Going to the effort to see a concert at the Hollywood Bowl! It’s such an iconic LA-area summer activity and really pleasant once you’re there and settled in, but takes a lot of wrapping my head around to organize the logistics to get us there (and home). My favorite summer ritual is continually having homemade iced tea around. Nothing complicated, I like red berry zinger or straight up hibiscus leaves. Just put it in a big jar on the counter overnight, or in the sun, and then pop in in the fridge. Repeat when its gone. It perpetually makes me feel like coming home from work is a little celebration, too: sitting down on the porch with a book and a glass of tea. Drinks and snack on the beach after the crowds have left and the air gets cooler. Basically summer vacation happy hour. My happiest times. My husband and I have found ourselves knee-deep in a new, first-time-parents, summer ritual. Our eight-month boy goes to bed and we head out to the front steps to enjoy a cocktail together. Every. night. Oh, how I love summer! My favorite ritual is spending they day at the pool, then grabbing popsicles on the way home! My little family of 4 makes the trip from Philadelphia to Ontario to spend the 4th of July (and the week around it) at the beach house my father’s family has lived in every summer since 1943. Don’t all American’s spend the 4th in Canada? I’m a nanny and every year the kids and I make a summer goals poster. We each write down 5 fun things we’ve never done, then proceed to accomplish them throughout the summer! Yesterday’s goal: strawberry picking at a berry farm, and oh man was that ever delicious! I love summer! Popsicles on the front porch, mint from the garden for mojitos, riding our bikes to a nearby ranch to listen to live music on Tuesday nights (while enduring bazillions of mosquitoes), long bike rides, swimming at the lake, and kids going to bed way too late because it’s still light out. Our annual clambake on the rocky shore of Maine. Selecting and indulging in birthday cakes (yep, that’s plural) on my birthday. After many school years overlooked this summer baby, I love celebrating my July birthday with family. A galley copy! Galleys remind me of the Strand – I haven’t been there in years so for all I know it looks like Borders now, but in my mind it’s dusty and wonderful and full of galleys that I could afford on a twenty-something salary. Can’t wait to read your latest! A bonfire on midsummer day, whatever the weather. Jumping over the embers for good luck and laughing at ourselves because it’s clearly a load of nonsense. Waking up early and swimming in the sea while the world wakes up. That’s a bit tricky with a toddler, but we give it a go! We spent every 4th of July at the lake and the boat parade always turned into the most epic water balloon battle royale. Balloon launchers, fire hoses, crazy costumes… so much fun! Our summer kick-off ritual is to pack up and head out on a multi day whitewater raft trip with three or four other families. We’ve started our summer this way for the past eight years and this year’s trip was a little bittersweet. The older kids had just celebrated their high school graduation and will be scattering to the four corners of the earth (literally) for college and other experiences. I’d look over at my daughter and my eyes just welled with tears. Happy and sad. You might be wondering what we ate on this four day back country trip with temperatures hovering near 100? I was responsible for night #3 dinner. Appetizer: brie with jalapeno raspberry jam on crackers and my husbands deer summer sausage. Dinner was pulled pork with cheesy homestyle potatoes and jalapenos in a taco size corn tortilla. On the side we had chopped red cabbage with julienne carrots, cranberries, feta cheese, toasted almonds and a champagne vinaigrette. Dessert was 7 layer bars. Happy and sad.